How Does Thyroid Health Affect Your Fertility? Did you know that it’s believed that up to 20% of women suffer from magnesium deficiency? And that several small studies have shown incredible results when it comes to treating magnesium deficiency among infertile women?! Magnesium is vital for the body to function in the most basic level. Not only does magnesium help regulate calcium, potassium and sodium, but magnesium is essential for cellular health and is a critical component of over 300 biochemical functions in the body. It assists in maintaining healthy blood pressure, balancing blood sugar, keeping your heart rate steady, and relaxing muscles. Optimal levels of magnesium can also help a woman’s tissue growth and recovery during pregnancy, and may help baby receive more nutrition through the placenta. Healthy levels can also alleviate morning sickness, hypertension, level mood swings and ward off preterm labor! Fallopian Tube Spasms: Magnesium deficiency can cause spasms in a woman’s fallopian tubes, preventing egg implantation. Blood Flow: Known as “the hormone of pregnancy”, magnesium ensures that the right amount of blood flows to the uterus. Hormone Levels: Magnesium regulates hormone levels, specifically progesterone, which is important for a healthy menstrual cycle, proper conception and a healthy pregnancy. Blood Glucose Levels: Magnesium harmonizes fluctuating blood glucose levels, which can lead to inflammation and subsequently damage to the ovaries. Leg Cramps. Upwards of 70% of adults experience leg cramps on a regular basis. Because of magnesium’s role in neuromuscular signals and muscle contraction, researchers have observed that magnesium deficiency is often to blame. Insomnia. Magnesium deficiency is often a precursor to sleep disorders such as anxiety, hyperactivity and restlessness. It’s been suggested that this is because magnesium is vital for GABA function, an inhibitory neurotransmitter known to “calm” the brain and promote relaxation. Anxiety. As magnesium deficiency can affect the central nervous system, more specifically the GABA cycle in the body, its side effects can include irritability and nervousness. As the deficiency worsens, it causes high levels of anxiety and, in severe cases, depression and hallucinations. High Blood Pressure. Magnesium works with calcium to support proper blood pressure and protect the heart. When you are magnesium deficient, often you are also low in calcium and tend towards hypertension or high blood pressure. Fatigue. Low energy, weakness and fatigue are common symptoms of magnesium deficiency. Migraines. Magnesium deficiency has been linked to migraine headaches due to its importance in balancing neurotransmitters in the body. A deficiency in magnesium causes our stress hormone cortisol to elevate, which in turn further depletes magnesium levels in your body. This becomes a vicious cycle. When we’re stressed, we excrete minerals from the body more readily, including magnesium. As I mentioned earlier, as the body becomes more magnesium deficient, we tend to experience higher levels of anxiety, irritability, and stress, which digs us deeper in the hole. As this continues to happen, your body’s natural balance falls out of tune, and all other hormones can be affected as a result. Fortunately, there are lots of magnesium-rich food that help bump up magnesium levels naturally. The key is buying foods that are grown organically or from your local farmer’s market. The soil from conventional farms is depleted of magnesium because they don’t rotate their crops or let the land rest. Also, they typically only put nitrogen, phosphorus and potassium back in the soil, but leave out magnesium. Typically, the foods you’ll find that are highest in magnesium are green leafy vegetables, which are packed with chlorophyll. Chlorophyll is known as the “lifeblood” of a plant and has the ability to absorb the sun’s light and turn it into energy. One major difference between human blood and chlorophyll is that human blood has iron at the center of the cell, but plants have magnesium at the center of the cell. Cook your salmon! I bake mine in 1 tablespoon of avocado oil, a squeeze of lemon, and a dash of salt and pepper for ~10 minutes at 400F, or until flaky. While your salmon is cooking, slice your zucchini and squash and saute in a skillet with ½ tablespoon of avocado oil and a dash of salt and pepper. 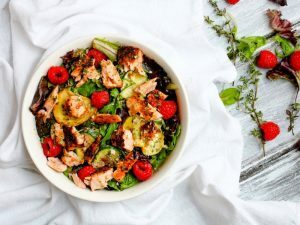 Once the the zucchini and salmon and cooked, it’s time to build your bowl – throw in the spinach, then veggies, and salmon. Drizzle in your balsamic, thyme sprigs leaves, and the rest of your oil. Toss everything together, and add your raspberries last, with a touch of lemon juice and your toasted pumpkin seeds. Enjoy! The easiest, quickest way to help your body absorb magnesium is to literally spray it on! My favorite magnesium spray – Ease – is incredible easy to use. Apply 20 – 40 sprays across your body per day after taking shower. You can spray the product anywhere on the body; however, the following areas are recommended for maximum absorption: inside the elbows, behind the knees, wrists, and the top of your feet. I recommend using the product right after a shower when your skin is clear of lotions or other oils. It should be noted that the first few times applying magnesium spray may result in some uncomfortable tingling. This sensation will dissipate the longer you use it – it’s just your body’s way of telling you that you are in fact deficient in magnesium. If the thought of using a magnesium spray overwhelms you, I have a supplement recommendation! Magnesium Buffered Chelate is one of the best absorbed forms of magnesium. This type of magnesium is bound to multiple amino acids (proteins) and used to restore magnesium levels quickly and efficiently. It’s best to take magnesium at bedtime as it also helps with sleep and relaxation. Epsom salt is actually a magnesium sulfate, and researchers have found that bathing in Epsom salts allows the body to absorb magnesium naturally. 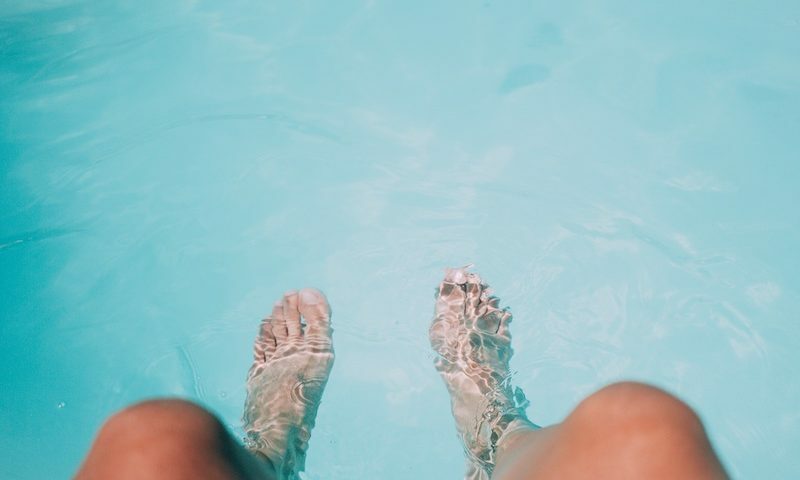 The added benefit is that Epsom salts baths are very calming and can also help the body to detox while providing aid to both the joints and digestive system. Chances are, you already have everything on hand that you need for an Epsom salt bath! Relax in the bath for at least 45-60 minutes 3-5 times per week when you are using this amount of magnesium, as you do not want to be wasteful. Relax while in the tub. Focus on taking deep breaths and directing them into your abdomen. If you’re looking for even more relaxation, add a few drops of your favorite essential oil. I recommend taking your Epsom salt baths just before bedtime—a hot bath is an excellent way to unwind at the end of the day, and will encourage your body to get a restorative, restful sleep. 1. Up to 20% of women suffer from magnesium deficiency – so you aren’t alone! 2. Magnesium plays a huge role in overall fertility and the development of a healthy fetus. 3. Increasing your magnesium levels is easily done through food, topical magnesium, capsules and Epsom salt baths! Do you suffer from anxiety or migraines? Have you tried using magnesium to treat these symptoms? If you suffer from magnesium deficiency, have you had success with magnesium sprays and supplements? Do you have a go-to recipe that uses all sorts of magnesium-rich foods to help balance your magnesium levels? Spread some Magnesium for Fertility lovin’! Sharing is caring, and I bet you have some friends who would love to read this too :). Looking to have a more in-depth conversation about the possibility of magnesium deficiency and how it might be affecting your fertility? Schedule a consultation with me!